Star Wars: The Force Awakens isn’t even in theaters yet, and we’re already starting to see images from the set of the next Star Wars film, Rogue One. Potential spoilers ahead. The UK’s Mirror newspaper has posted up a couple of photographs that are reportedly from the set of the first anthology film. 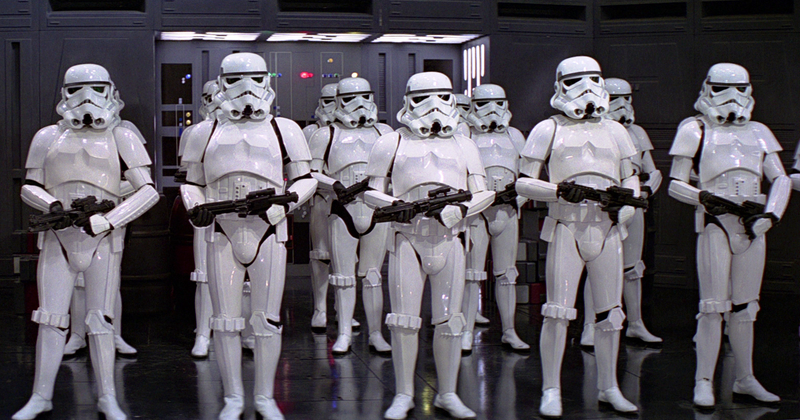 It should come as no surprise that there’ll be stormtroopers in this upcoming film, which is expected to take place ahead of Star Wars: A New Hope. What’s nice to see here is that the classic stormtrooper doesn’t appear to have been changed up much, at least by looking at the images that they have. Undoubtedly, there’ll be some minor differences, but it’s nice to see the classic armor making an appearance. The scenes appear to be set in a desert/beach location with the hatch to a landing ship. According to the article on the Mirror, these sets have been recycled from filming on The Force Awakens. It’s interesting to live in a world where we’re getting set rumors and tidbits from two separate Star Wars films at the same time, and it does make one wonder if we’re facing an imminent overload of the franchise. Not only are we looking at the major marketing push for one film, but we’re going to see this happen perennially at least through 2019. Head over to the Mirror Online to take a look at the images.